Live crabs and small fish are good baits for Cobia. Keep bait near the surface or, if Cobia are deeper, add just enough weight to get the bait down and still retain its movement. Medium to heavy tackle is required to land these fish which average 30 pounds. Large specimens in the 50-80 pound class are frequently caught and cherished by the lucky angler who outmatches these powerful fish. Habitat: Cobia are found in near-shore and inshore waters with inlets and bays. 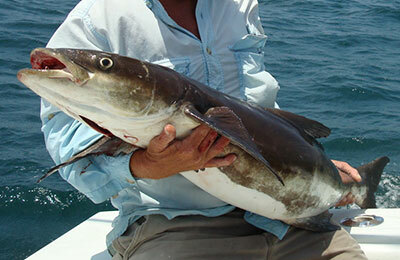 Cobia are frequently found around buoys, pilings and wrecks in these areas. Behavior: They spawn in spring and early summer. Appearance: Long, slim fish with a broad depressed head. The lower jaw protrudes past the upper jaw. Dark lateral stripe extends through the eye to the tail. First dorsal fin has 7 to 9 free spines. When young, has conspicuous alternating black and white horizontal stripes.